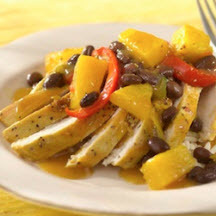 Spicy Caribbean-style baked chicken served on a bed of rice topped with a flavorful pineapple and black bean sauce. Spray large skillet with cooking spray; heat over medium heat until hot. Cook chicken breasts over medium heat until browned, 5 to7 minutes on each side; sprinkle lightly with salt and pepper. Transfer chicken to 13 x 9 inch baking pan. Spray medium skillet with cooking spray; heat over medium heat until hot. Sauté red pepper, onions, garlic, jalapeño pepper, and ginger root until onions are tender, about 5 minutes. Stir in chicken broth, pineapple, chutney, brown sugar and curry powder; heat to boiling. Pour mixture over chicken. Bake uncovered, until chicken is tender and juices run clear when pierced with a fork, about 30 minutes. Arrange chicken on serving platter; transfer pineapple mixture to large skillet; heat to boiling. Mix cornstarch and cold water; stir into pineapple mixture. Boil, stirring constantly, until thickened about 1 minute. Stir in black beans; cook over medium heat 2 to 3 minutes. Spoon pineapple-bean mixture over chicken; serve with rice. Nutritional Information Per Serving (1/6 of recipe): Calories 459; Fat 4g; % Calories from Fat 9; Carbohydrate 72g; Sodium 319mg; Protein 35g; Cholesterol 68mg. Recipe provided courtesy of The Bean Education & Awareness Network. Photograph courtesy of S&W Beans.